For the stand-up comedy album, see Beer Hall Putsch (album). Around 23:00 (11 p.m.), Major-General von Danner, along with fellow generals Adolf Ritter von Ruith [de] and Friedrich Freiherr Kress von Kressenstein, compelled Lossow to repudiate the putsch. 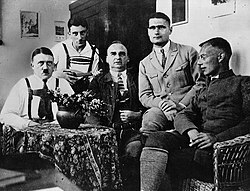 Hitler's trial began on 26 February 1924 and lasted until 1 April 1924. Lossow acted as chief witness for the prosecution. Hitler moderated his tone for the trial, centering his defence on his selfless devotion to the good of the people and the need for bold action to save them; dropping his usual anti-Semitism. 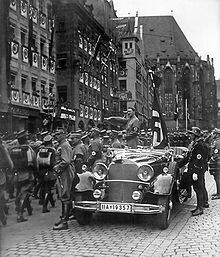 He claimed the putsch had been his sole responsibility, inspiring the title "Führer" or "Leader". The lay judges were fanatically pro-Nazi and had to be dissuaded by the presiding Judge, Georg Neithardt (de), from acquitting Hitler. Hitler and Hess were both sentenced to five years in Festungshaft [de] (literally fortress confinement) for treason. Festungshaft was the mildest of the three types of jail sentence available in German law at the time; it excluded forced labour, provided reasonably comfortable cells, and allowed the prisoner to receive visitors almost daily for many hours. This was the customary sentence for those whom the judge believed to have had honourable but misguided motives, and it did not carry the stigma of a sentence of Gefängnis or Zuchthaus. In the end, Hitler served only a little over eight months of this sentence before his early release for good behaviour. ^ "Hermann Goring (German minister) – Britannica Online Encyclopedia". Britannica.com. Retrieved 26 March 2011. ^ Bytwerk, Randall (2000). "Nazi ceremonies for 9 November 1942". German Propaganda Archive. Archived from the original on 5 May 2009. Retrieved 26 April 2009. 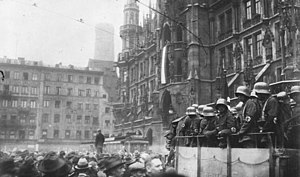 Wikimedia Commons has media related to Hitlerputsch.